Pele is arguably the greatest footballer (US: soccer player) who ever lived, the Brazilian whose international career spanned three decades and several World Cups. He also had the signal honour of a poster of him hanging on my bedroom wall in the early 1970s. That poster was replaced in 1978 by a Debbie Harry poster. 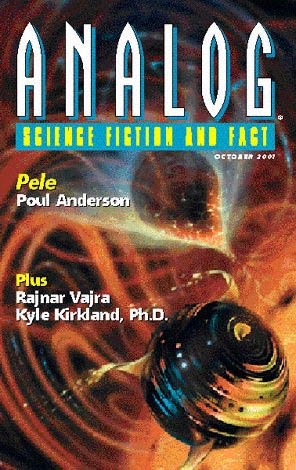 Pele is also the name of this Larry Niven Kzin sharecrop story. The Company Man. Daniel Hatch. Gary Waters is leading commercial mining company Extra-G’s outfit on Tiant. Hatch provides an interesting Pre-Problem description of a huge circular exercise wheel, and it is whilst Waters is in this wheel that The Problem Arises – the Life Support system is failing! Can the shrewd Waters solve the problem (rhetorical question) and can he subsequently avoid commercial disaster (ditto)? An addition to the not insubstantial number of stories on extreme longevity. The main character is some 12,000 years old which must put him well beyond most other ultra-aged (and well beyond the elasticity of my suspension of disbelief). The extreme longevity is plot-wise unnecessary as the interesting elements of the story revolve around the main character’s relationship with his mother (mortal, and long-dead), and his father and son, both of whom are similarly blessed/cursed with longevity. In such a long life the loss of loved ones and lost moments remain to be mourned. Standing Firm on the Pipette Line. Rajnar Vajnar. Somewhat clunky story which aims to maintain a humorously droll tone throughout. Mayor Gould of Boston faces a problem: the large, intelligent rats which revealed their existence to humanity some years ago, set the Mayor a challenge of a scary and subterranean nature. The denouement is of a twist in the (pink, hairless) tail nature. Oven, Witch and Wardrobe. Tom Sweeney. Time travel, broomsticks, cats, Hansel and Gretal, Salem. Contrived stuff and nonsense. The saving grace is that it is short. Going, going, gone. Stephen L. Burns. Nicely wrought yarn about two elderly antique collectors who find something most peculiar in a box of junk. The device, once assembled, appears to be of alien origin and of no earthly purpose. However, when a meteorite destroys the neighbour’s lawn mower, an opportunity presents itself. The Kzin sharecrop is not the way I would want to remember PA! I enjoyed the gentle Burns story, and found the Phalen and Hatch stories OK. The Vajnar story didn’t do much for me, and the Sweeney story grated more than a little.